This article covers basics of managing projects professionally (PMP), which is very useful for practicing project managers as well as future project managers who aspires to clear PMP exam. Theoretically there are 5 process groups and 9 knowledge areas defined for project management in PMBOK (Project Management Body of Knowledge) released by PMI (Project Management Institute). The 5 process groups are initiating process group, planning process group, executing process group, monitoring and control process group and close process group. The 9 knowledge areas are project integration management, project scope management, project time management, project cost management, project quality management, project human resource management, project communication management, project risk management and project procurement management. There are about 44 project management processes which are mapped between the five process groups and nine knowledge areas. 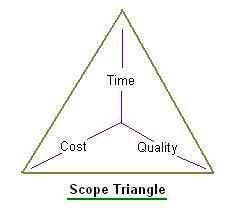 Let us understand the challenge of project manager in any project with the help of scope triangle mentioned below. As shown in the figure, project manager's real challenge is to control equally three main parameters during execution of the project, they are time, cost and quality based on the scope defined at the start of the project. There are some maintenance/development projects where in scope keep changing based on the need of the customer or varying customer requirement. In this situation agile way of managing project is the ideal choice rather than water fall way of managing projects. Other than the above human resource management throughout the project is also important. Project manager need to ensure that same number of human resources are available from initiation of the project till the end. The main three processes in HR management are acquire team, develop the team and manage the team. At the start of any project manager lists various requirements and map them to tasks and assign human resources who are actually going to carry out the tasks during the execution of the project. After mapping the tasks to human resources, project manager will estimate time duration for each of these activities (tasks) with the help of the team. There are various ways to estimate activity duration; the most popular among them is PERT. The estimate is based on P (Pessimistic time), M (Most likely time) and O (Optimistic Time). The formula is Activity duration= (P+4M+O)/6. The project manager will usually include some buffer to avoid last minute delivery problem to the customer. The time versus activities chart created is called Gantt chart and can be generated using Microsoft project and other useful project management tools. In Gantt chart time is on horizontal axis and various activities are on vertical axis. Time can be in units of hour, day, month or year. Human resources are also shown along the activities. The most adopted project management techniques for time compression are fast tracking and crashing. In fast tracking multiple activities are executed in parallel. For this Finish-start relationship between activities need to change to start-start. In the other technique called crashing, skilled resources are pulled from other projects and put into the delayed project to finish it fast and on time. Project management techniques can be gained by applying it practically and hence this article covers few of the points of the project management. How to pass PMP Exam on first attempt, READ MORE. PMP Formulas useful to pass PMP exam, READ MORE. PMP Training Institutes, READ MORE. Agile scrum methodology and scrum basics,READ MORE. The managementtutor site contains resources very useful for management enthusiasts. It covers various branches of management which include project management, marketing, accounting management, organizational behavior, quantitative analysis, finance and accounting, operations management, economics, strategy etc. It also provides guide for various management exams including resources which helps pass the exam such as PMP. The manegementtutor covers calculators section which covers easy to use calculators for performing various calculations.